To Cite: Shahsiah R, Salarvand S, Miri R, Ghalehtaki R, Rakhshani N. The Prevalence and Associated Factors of Microsatellite Instability in Ovarian Epithelial Cancers Detected by Molecular Genetic Studies in a Sample of Iranian Women, Int J Cancer Manag. 2017 ; 10(12):e11599. doi: 10.5812/ijcm.11599. Background: Microsatellite instability, the main genetic element in HNPCC syndrome, is associated with a number of cancers, including ovarian epithelial carcinomas. These cancers have distinct characteristics compared to non-MSI related ones. Objectives: The present study aims at determining the prevalence of microsatellite instability in ovarian carcinomas and their associated factors in Iranian patients. Methods: Paraffin-embedded blocks, belonging to 37 patients with definite diagnosis of ovarian epithelial cancers, were retrieved from the archives. After DNA extraction from tumor tissue and PCR reaction, the results were assessed in accordance with melting curve analysis. Subsequently, the relationship among microsatellite status and tumor histology, grade, stage, and size were investigated statistically. Results: The predominant histological type was serous histology. Four out of 37 carcinomas were microsatellite unstable (10.8%) and only 1 was MSI-high type (2.1%). The MSI was more frequent among younger patients with unilateral, non-serous histology, non-high grade, and stage I tumors without omental involvement. After statistical analysis, the only significant relationship was found between histological type (non-serous) and microsatellite status. Conclusions: Microsatellite stable and unstable ovarian cancers may have different associations with various factors in a sample of Iranian women. The identification of these characteristics may help narrow down indications to test this prognostic and predictive genetic error. The DNA mismatch repair (MMR) system is responsible for correcting genetic errors in the coding and non-coding DNA regions throughout the genome (1). However, when the MMR system is defected, these errors could pass to the next generation of cells. MMR system deficiency may lead to genetically uncorrected cellular proliferation and, consequently, to the development of a number of neoplasms in the human body (2). Microsatellites are small, repetitive sequences of DNA, consisting of 1- to 6-base pairs that are distributed throughout the human genome. When the defined number of each microsatellite is altered, through insertion or deletion of 1 or more base pairs, it is called microsatellite instability (3). Microsatellite instability (MSI) is a reflection of the defects in a DNA mismatch repair system. The most well-established link between MSI and malignant neoplasm has been reported in colorectal cancers, where 15% to 20% of sporadic tumors are MSI related (4). Another less studied, yet important neoplasm that has been associated with MSI is ovarian epithelial cancer, which is the fifth most common cancer among women worldwide. Ovarian cancers are commonly diagnosed at later stages, and are among the most deadly gynecological malignancies in women (5). Limited studies in our country have investigated the etiology and prognosis of this type of malignancy. Therefore, in ovarian carcinomas, molecular and genetic prognostic and predictive factors, including DNA mismatch repair system and its reflection, MSI, are worth investigating. Ovarian cancers that are associated with MSI, like other organs with similar genetically based errors, may have distinct characteristics in terms of age at presentation, mortality rate, and response to standard chemotherapeutical regimens. MMR-related colon cancers have better prognosis compared to those without this genetic defect (3). The same phenomenon may be true with ovarian cancers. Classic platinum-based chemotherapies are the mainstay in the treatment of both early and advanced carcinomas. Nevertheless, some studies have shown, although not definitively, that these particular types of cancer may show some sort of resistance to routine chemotherapy regimens, including platinum (cisplatin and carboplatin) and taxane (paclitaxel) (6). Hence, the detection of the underlying MMR system defects in ovarian epithelial neoplasms may lead clinicians to select more efficacious treatment strategies, alongside better imagination of the natural course of the disease. To date, no study has been conducted in Iranian, and even among Middle Eastern populations, to determine the prevalence and associated factors of microsatellite instability in ovarian epithelial carcinomas. Given the different outcomes described for these types of tumors, this study could provide a clearer picture of ovarian epithelial cancers’ profile in the Iranian population. In this study, the specimens with previously confirmed diagnosis of ovarian epithelial carcinoma, from 2010 to 2014, were retrieved from the archives and prepared for molecular studies. The patients had given informed consents at the time of admission in order that their specimens in pathology laboratory would be available for research purposes in future. Institutional review board and ethics committee confirmed the study design. First, authors reviewed all slides and the original paraffin-embedded tissue blocks were sent to the molecular pathology laboratory. The samples were prepared as three 5-micrometer thick slices from tumor tissue. The first 2 slices were sent for DNA extraction and the third was stained with H&E to confirm the presence of tumor in the sliced areas. A sample would be excluded if the DNA extraction failed or if there was no tumor cell present in the light microscopic evaluation. In order to prevent contamination of samples, each slice was cut by a new blade and, then, the slices were transferred to 1.5-mL Eppendorf tubes by disposable applicators. Subsequently, paraffin was removed by adding xylene and the samples were washed with pure ethanol. In the next step, tissue lysis buffer and proteinase K were added to microtubes and were placed at a temperature of 55°C. After complete dissolution of all the tissue fragments, a binding buffer, isopropanol, and an inhibitor-removal buffer were added and centrifuged briefly. Finally, the tumor DNA was purified, using DNA extraction kit (Roche diagnostics GmbH, Mannheim, Germany). The extracted tumor DNA was diluted to 1:10 by adding elution buffer. Forward and reverse primers for amplification of sequences NR27, BAT26, BAT25 NR24, and NR21 were ordered at Macrogen (Geum Chun-Gu, Seoul, Korea) with their previously defined sequences (7). The PCR for target sequences was performed in 20 µL reaction containing 10 µL of 2x SYBER premix ex Taq master mix (Takara Bio, Ostu, Shiga, Japan), 1 µL of forward and reverse primers with concentration of 10 PM/µL, and about 50 ng extracted tumor DNA. Finally, the PCR reaction was performed in light cycler Nano machine (Roche diagnostics GmbH, Mannheim, Germany) with PCR condition, being initial denaturation at 94°C for 0.5 minutes; then, 45 two-step cycles as follows: 95°C for 10 seconds; and 60°C for 30 seconds. Finally, a 5-minutes terminal extension was performed at 72°C, followed by a melting analysis of the PCR product. The melting graphs were assessed, and if acceptable, the samples were sent to Macrogen (Geum chun-gu, Seoul, Korea) for capillary electrophoresis. The results of electrophoresis were analyzed, using peck scanner software version 1.0 (applied biosystems, CA, USA). Instability in 2 or more markers was considered MSI-H, and instability in 1 marker was considered MSI-L.
IHC staining was carried out on the MSI-H specimen with anti-MLH1, MSH2, MSH6, and PMS2 antibodies (Dako, Glostrup, Denmark). To analyze the correlations of microsatellite instability with histological grade, FIGO stage, tumor laterality, and omental involvement among ovarian carcinomas, Chi-squared tests were carried out. P value < 0.05 was regarded as statistically significant. In this study, the specimens belonging to 37 malignant ovarian epithelial tumors were assessed for microsatellite instability. The mean age of the patients was 45.13 ± 9.50. The mean size of the tumors was 11.40 ± 5.96 cm. Nineteen tumors (51.4%) were unilateral. Among various histological types, serous adenocarcinoma was the predominant type, with 54.1% of all carcinomas, while others were endometrioid with 21.6%, clear-cell with 13.5%, and mucinous with 10.8%. Based on the world health organization (WHO) classification for histological grading, 61.1% were high grade, while 16.7% and 22.2% were low and intermediate grade, respectively. According to the FIGO staging system, 47.2%, 5.6%, and 47.2% of the tumors were stage I, II, and III, respectively. About 43% of the tumors were associated with omental involvement. Of our specimens, only 4 out of 37 (10.8) were microsatellite unstable (CI95% = 2.7 - 21.6). The rate of MSI-H and MSI-L were 2.7% (1.37) and 8.1% (3.37), respectively. The only tumor with MSI-H, in which capillary electrophoresis graph shows instability in BAT26, NR24, NR27 (Figure 1), was a unilateral, 9 cm, Grade II endometrioid adenocarcinoma, with FIGO stage IIB, and without omental involvement. Shown in Table 1, the rate of microsatellite instability is higher among patients under 45, with larger than 10 cm, and unilateral tumors, compared to older women, who had smaller and bilateral tumors. One of the major endpoints of this study was the assessment of the relationship between MSI status with tumor histological type, grade, and FIGO stage. Our study showed that microsatellite instability was more prevalent in non-serous, low-intermediate grade, and stage I neoplasms. Also, the MSI was more pronounced in cases with no omental involvement. According to a significance level of 0.05, the histological type was the only parameter having a significant relationship with the MSI tumors. The characteristics of microsatellite unstable ovarian epithelial cancers have been depicted in Table 2, where NR21 and BAT26 loci were predominant mutations, each found in the 2 cases. Nuclear immunoreactivity for hMLH1, hMSH2, hMSH6, and PMS2 proteins was performed on the only MSI-H tumor of our specimens. In addition, hMLH1 and PMS2 showed positive nuclear reaction, whereas hMSH2 and hMSH6 showed a negative result that is consistent with the molecular method (Figure 2). Generally, immunohistochemistry and molecular genetic studies have been used to assess MMR proteins or their coding genes. According to the literature, the MSI detection method has been the more cost-effective and accurate, along with the fact that it is suitable in clinical settings (8). Following an NCI workshop in 1977, Bethesda markers were introduced for the detection of MSI in colon cancer. Despite the well-known efficacy in colon carcinoma of Lynch syndrome, it remained uncertain whether these markers were the best option for assessing MMR-related ovarian cancers (4). We used 5 mononucleotide markers included in the MSI analysis system, of which BAT25 and BAT26 are shared with the Bethesda panel. Recent studies have shown that the use of pentaplex panel of mononucleotide markers show superior results in terms of sensitivity and specificity compared to NCI panel. Moreover, there is no need for simultaneous normal DNA matching because of the quasimonomorphic nature of pentaplex panel (9-12). In our study, about 11% (CI95%: 2.7 - 21.6) of specimens were positive for MSI, of which, 3 were MSI-L and only 1 was MSI-H. Moreover, in other studies among non-selected cases of ovarian cancers, between 0% to 37% have been MSI-H positive (13). The wide range was due to differences in study design, number, and type of detector markers and the criteria for the definition of MSI-H (14, 15). However, in the studies using Bethesda panel markers or MSI analysis system, the rate of MMR system defects has been reported at about 10% (CI95% = 6 - 14) in ovarian epithelial cancers (16-18). Therefore, our results are consistent with previous findings regarding the overall rate of MSI in all histological types. In previous reports, the overall rate of BAT25 and BAT26 positivity was 6.7% and 4.8%, respectively, using different MSI panels (16). Similarly, 5.4% of our samples were instable for BAT26, while none showed instability for BAT25. In the present study, the prevalence of MSI was significantly higher among non-serous carcinomas, while all serous tumors were microsatellite stable. The only MSI-H case was an endometrioid adenocarcinoma (12.5% of this type). Other studies also pointed out that non-serous malignant ovarian tumors were more likely to be MSI positive (13). This finding is considered important because serous histology is the dominant type in all ovarian carcinomas (more than 50% in our study). This higher rate of microsatellite instability among non-serous tumors can be explained by the fact that such ovarian tumors, endometrioid and mucinous in particular, may be metastatic sites of undiagnosed primary endometrial or colon cancers, and we know that the MMR defect is responsible for a considerable fraction of these carcinomas (14). Immunohistochemical staining was performed on the only case that showed MSI-H in molecular method. This case showed negative reaction for MSH2 and MSH6, while it was positive for MLH1 and PMS2 that is consistent with a deficiency in the MMR system. Other studies have shown a frequency of about 6.4% loss in MLH1 or MSH2 in ovarian carcinomas (16). Meanwhile, the loss of MSH6 is more common in certain variants of ovarian carcinomas, such as clear-cell, endometrioid, and mucinous types (19). In this study, we used microsatellite assay to find the genomic defects in DNA mismatch repair system. We could say that the DNA mismatch repair system defects, to which a small but critical fraction of ovarian epithelial carcinomas is attributable, deserve routine investigation. The latter is especially important in the case of non-serous ovarian epithelial cancers. Pathologists should be aware of the importance of reporting MSI as indicated, because it may help define the best treatment strategy for MMR defected cases. The authors would like to thank Ms. Behnaz Sarhandi for her technical support. Financial Disclosure: Tehran University of Medical Sciences, deputy of research funded this project; grant number: 94-01-30-27501. 1. Alvi AJ, Rader JS, Broggini M, Latif F, Maher ER. Microsatellite instability and mutational analysis of transforming growth factor beta receptor type II gene (TGFBR2) in sporadic ovarian cancer. Mol Pathol. 2001;54(4):240-3. [PubMed: 11477138]. 2. Dellas A, Puhl A, Schraml P, Thomke SE, Ruschoff J, Mihatsch MJ, et al. Molecular and clinicopathological analysis of ovarian carcinomas with and without microsatellite instability. Anticancer Res. 2004;24(1):361-9. [PubMed: 15015622]. 3. Ribic CM, Sargent DJ, Moore MJ, Thibodeau SN, French AJ, Goldberg RM, et al. Tumor microsatellite-instability status as a predictor of benefit from fluorouracil-based adjuvant chemotherapy for colon cancer. N Engl J Med. 2003;349(3):247-57. doi: 10.1056/NEJMoa022289. [PubMed: 12867608]. 4. Dietmaier W, Wallinger S, Bocker T, Kullmann F, Fishel R, Ruschoff J. Diagnostic microsatellite instability: definition and correlation with mismatch repair protein expression. Cancer Res. 1997;57(21):4749-56. [PubMed: 9354436]. 5. Caliman LP, Tavares RL, Piedade JB, D. E. Assis AC , D. E. Jesus Dias DA Cunha K , Braga LD, et al. Evaluation of microsatellite instability in women with epithelial ovarian cancer. Oncol Lett. 2012;4(3):556-60. doi: 10.3892/ol.2012.776. [PubMed: 22970055]. 6. Massey A, Offman J, Macpherson P, Karran P. DNA mismatch repair and acquired cisplatin resistance in E. coli and human ovarian carcinoma cells. DNA Repair (Amst). 2003;2(1):73-89. [PubMed: 12509269]. 7. Esmailnia G, Haghighi MM, Javadi G, Parivar K, Zali MR. Microsatellite instability markers status in colorectal cancer. Zahedan J Res Med Sci. 2014;16(12):26–30. 8. Murphy KM, Zhang S, Geiger T, Hafez MJ, Bacher J, Berg KD, et al. Comparison of the microsatellite instability analysis system and the Bethesda panel for the determination of microsatellite instability in colorectal cancers. J Mol Diagn. 2006;8(3):305-11. doi: 10.2353/jmoldx.2006.050092. [PubMed: 16825502]. 9. Bacher JW, Flanagan LA, Smalley RL, Nassif NA, Burgart LJ, Halberg RB, et al. Development of a fluorescent multiplex assay for detection of MSI-High tumors. Dis Markers. 2004;20(4-5):237-50. [PubMed: 15528789]. 10. Buhard O, Suraweera N, Lectard A, Duval A, Hamelin R. Quasimonomorphic mononucleotide repeats for high level microsatellite instability analysis. Dis Markers. 2004;20(4-5):251-7. doi: 10.1155/2004/159347. 11. Buhard O, Cattaneo F, Wong YF, Yim SF, Friedman E, Flejou JF, et al. Multipopulation analysis of polymorphisms in five mononucleotide repeats used to determine the microsatellite instability status of human tumors. J Clin Oncol. 2006;24(2):241-51. doi: 10.1200/JCO.2005.02.7227. [PubMed: 16330668]. 12. Xicola RM, Llor X, Pons E, Castells A, Alenda C, Pinol V, et al. Performance of different microsatellite marker panels for detection of mismatch repair-deficient colorectal tumors. J Natl Cancer Inst. 2007;99(3):244-52. doi: 10.1093/jnci/djk033. [PubMed: 17284719]. 13. Pal T, Permuth-Wey J, Kumar A, Sellers TA. Systematic review and meta-analysis of ovarian cancers: estimation of microsatellite-high frequency and characterization of mismatch repair deficient tumor histology. Clin Cancer Res. 2008;14(21):6847-54. doi: 10.1158/1078-0432.CCR-08-1387. [PubMed: 18980979]. 14. Pal T, Permuth-Wey J, Sellers TA. A review of the clinical relevance of mismatch-repair deficiency in ovarian cancer. Cancer. 2008;113(4):733-42. doi: 10.1002/cncr.23601. [PubMed: 18543306]. 15. Liu J, Albarracin CT, Chang KH, Thompson-Lanza JA, Zheng W, Gershenson DM, et al. 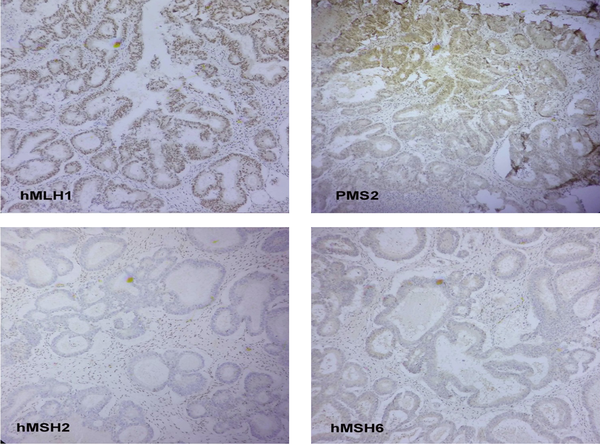 Microsatellite instability and expression of hMLH1 and hMSH2 proteins in ovarian endometrioid cancer. Mod Pathol. 2004;17(1):75-80. doi: 10.1038/sj.modpathol.3800017. [PubMed: 14631366]. 16. Murphy MA, Wentzensen N. Frequency of mismatch repair deficiency in ovarian cancer: a systematic review This article is a US Government work and, as such, is in the public domain of the United States of America. Int J Cancer. 2011;129(8):1914-22. doi: 10.1002/ijc.25835. [PubMed: 21140452]. 17. Lu FI, Gilks CB, Mulligan AM, Ryan P, Allo G, Sy K, et al. Prevalence of loss of expression of DNA mismatch repair proteins in primary epithelial ovarian tumors. Int J Gynecol Pathol. 2012;31(6):524-31. doi: 10.1097/PGP.0b013e31824fe2aa. [PubMed: 23018216]. 18. Vierkoetter KR, Ayabe AR, VanDrunen M, Ahn HJ, Shimizu DM, Terada KY. Lynch Syndrome in patients with clear cell and endometrioid cancers of the ovary. Gynecol Oncol. 2014;135(1):81-4. doi: 10.1016/j.ygyno.2014.07.100. [PubMed: 25093288]. 19. Zhai QJ, Rosen DG, Lu K, Liu J. Loss of DNA mismatch repair protein hMSH6 in ovarian cancer is histotype-specific. Int J Clin Exp Pathol. 2008;1(6):502-9. [PubMed: 18787632].